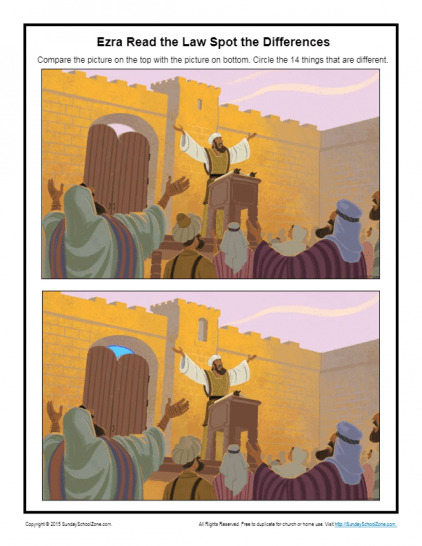 The spot the differences activities below highlight various Bible events and situations. Click on the title of an activity to be taken to a web page where you'll be able to download it. In an attempt to see Jesus fall early in His ministry, Satan tempted Jesus in the wilderness, but Jesus remained sinless. 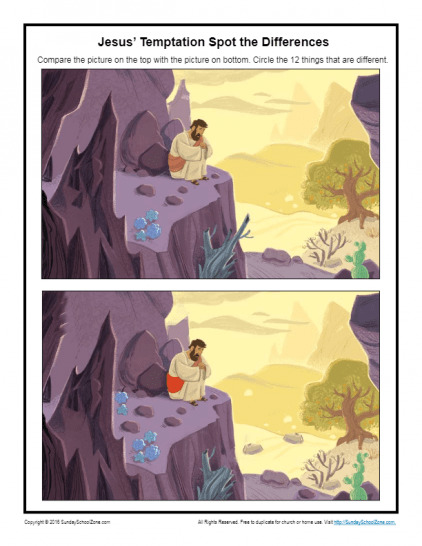 This free printable spot the difference activity will help children remember Jesus did not sin. When Jesus was baptized He identified with sinners and showed He would die and be raised on our behalf. 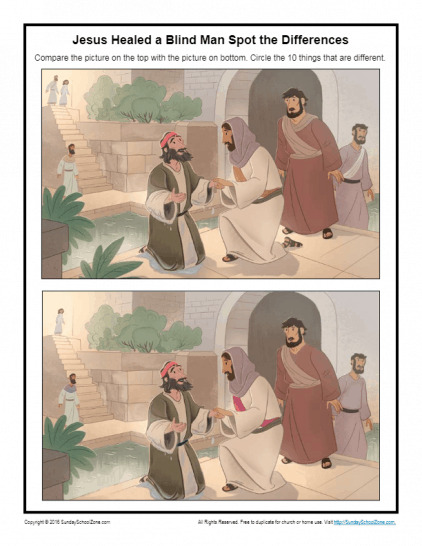 This free spot the difference activity will help kids remember this very important event in Jesus’ life. 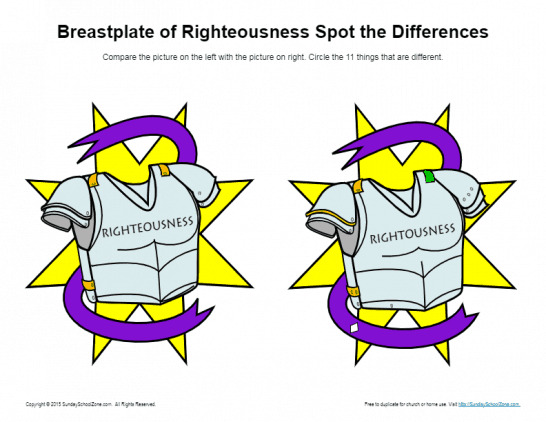 This spot the differences activity, based on Ephesians 6:14b, will help children understand the importance of a breastplate and the need to trust in Christ’s righteousness, not our own. It can be used in a homeschool setting, one-on-one, or in a classroom setting like Sunday School. God knew that John the Baptist would be a special person with a special job even before he was born. 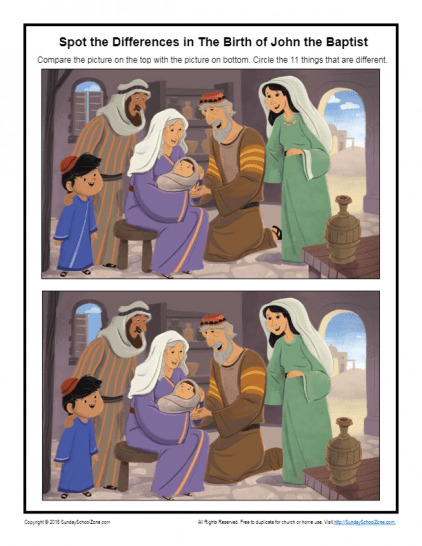 This free, printable, spot the differences activity will help children learn about the birth of John the Baptist and discover that John helped prepare the people of Israel for Jesus. God always desires the best for His children. God wanted to be the King of Israel, but the people of Israel wanted a human king like the other nations around them. 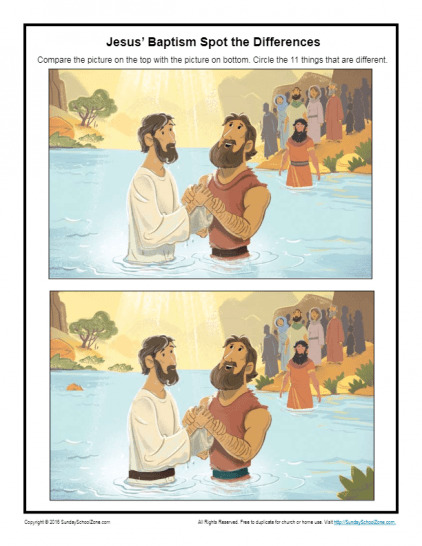 This spot the differences activity will help children remember that God always knows what is best for us. 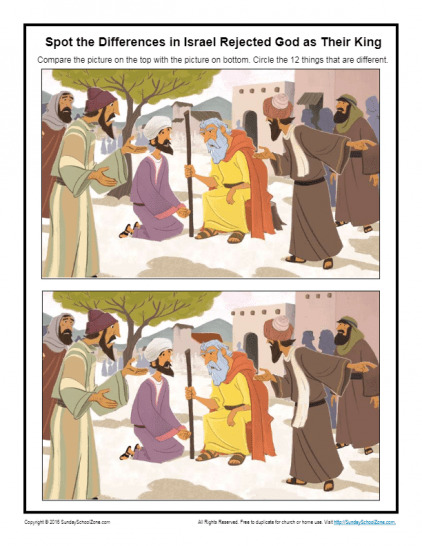 This free, printable spot the difference activity, based on Nehemiah 8:5-8, will help kids learn about the story of Ezra and the importance of hearing and learning the Bible. It can be used in a homeschool setting, one-on-one, or in a classroom setting like Sunday School. Elijah was used by God in a special way to show the nation of Israel that God is in control of everything, even the weather. 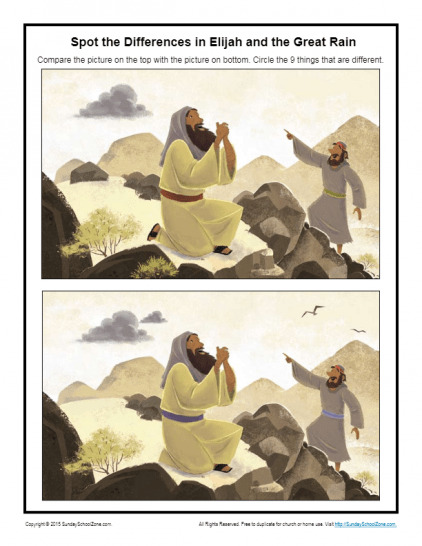 This spot the differences activity will help kids learn to trust God and remind children that only God is in control of everything. 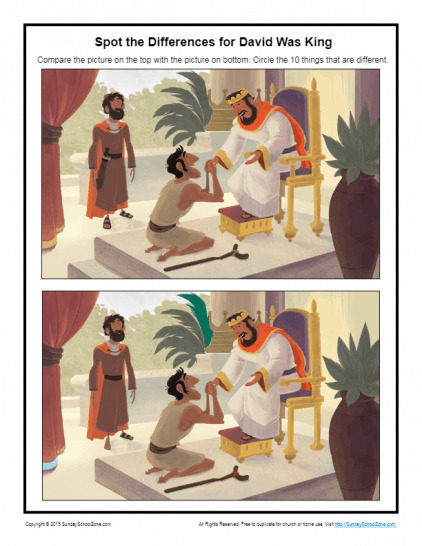 This free, printable spot the differences activity, based on 2 Samuel 9:1-13, will help kids learn the value of generosity. It can be used in a homeschool setting, one-on-one, or in a classroom setting like Sunday School.